On May 3, 2014, Emily Mills was presented with the 13th annual Karen Minner Scholarship Award at Highland View Academy's alumni weekend. Emily will receive $1000 toward her tuition for the 2014-2015 school year. 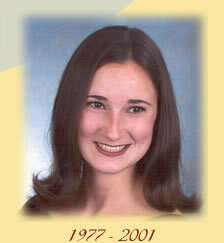 Karen was a dedicated follower of Jesus who also took academics seriously throughout academy and college. Each year this scholarship will be awarded to an HVA student who exhibits the qualities of Christian character seen in Karen's life, is held in high esteem by both faculty and peers, and maintains a high grade point average. Karen loved and served the Lord her whole short life. She trusted in Him. She accepted the premature end of her life among us with the same grace she had brought to living it. We believe Karen would be pleased by this scholarship in remembrance of her and her love for Highland View Academy.